Hey all! We’re ringing in Monday with another look at our in-depth character backstories. This week’s piece features Sadira. 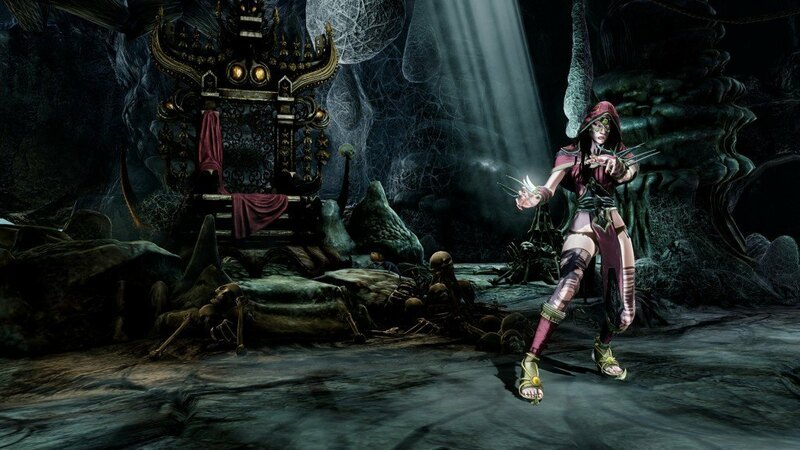 If you recall, she was the first new character introduced to the KI lineup back in 2013. How does her story weave in to the web that is Killer Instinct canon? Check out her details below. Sadira is a cold-blooded assassin who has contracted with Ultratech to quiet whistleblowers, activists, politicians and any other enemies of the megacorporation who might prevent the artificial intelligence called ARIA from executing her plans for an evolved humanity. Sadira was born in a refugee camp on the Thai border, an area rife with bloody conflicts waged between ethnic groups and the Communist government of Myanmar. As a child she learned to fight in order to survive in the tough camp, training in the muay boran—the ancient boxing style of the region. Her instructor tried to teach her that this martial art was meant to build character, but what Sadira loved about it was the sheer violence…the thrill of pummeling, dominating and humiliating another human. And she craved something darker and more satisfying than just a contest. When she was a teenager she was recruited by the female insurgent group known as the Red Eyes of Rylai. She gladly joined their order and quickly rose up the ranks due to her innate ferocity. Her first act was to fight a fellow initiate using glass shards tied to her fists with hemp rope. Sadira toyed with her outmatched and terrified opponent, using the glass to disfigure her face, leaving her alive as a warning to the others. The Red Eyes made their jungle base in a hidden subterranean limestone cave system that had been used centuries before as a temple. The Master of the Red Eyes—an old but still very dangerous assassin—took Sadira under her wing, knowing that she had a dangerous but extraordinary fighter in her midst. She treated Sadira like a daughter, giving the young woman the only true affection she’d ever known. The Master wore a necklace in the shape of a golden spider: it was the symbol of her chiefdom. For years Sadira coveted this thing with an all-consuming lust, pretending to love and respect her leader, but quietly plotting to seize control of the Red Eyes. Eventually Sadira came to be considered one of the Red Eye’s best assassins, but more than once her impetuousness nearly got her killed. What’s more she constantly bullied the other women in the Order, and her rash nature caused her to make a grave mistake on a covert mission, getting her fellow strike team members killed in the process. One night the master took Sadira to a secret chamber in the caverns and showed her a beautiful gilded throne. This was the place where she came and meditated. She told her pupil that one day Sadira might sit in this chair, but that first she would have to earn the position of Master through bravery and sacrifices. She would also have to learn to temper her recklessness. Eventually, the Master explained, the two would have a ceremonial fight in front of all the members of the Red Eyes and, if Sadira was victorious, then and only then would she be handed the spider necklace and the throne. Sadira stood over her dead master, staring at her curiously for some time. Then she took the necklace from the corpse and put it around her own throat. It felt extremely heavy and cold. She went to the throne and sat on it, lounging lazily. Suddenly she felt something bite into her skin. The legs of the spider had come alive! As Sadira screamed and clawed at the spider, the golden thing dug itself into her chest, burrowing deep into her flesh, coming to rest next to her heart which throbbed and rolled in her breast as if it were a frightened animal. Her forearms and palms tingled painfully as though they were buzzing with an electrical current. At that moment webs burst from her hands and coated the cave wall. She instinctively leaped up and clung to the gossamer threads, breathing hard. A dark and chill power emanated from that golden thing inside her body. Sadira could feel it surround her heart, slowly consuming and replacing it. There was a sharp pain in her chest that would not go away…a pain that would always remain. But losing her heart was worth the price, for the power that came from the spider was magnificent. Under Sadira’s nefarious direction the Red Eyes expanded their activities, providing services across the globe—paid murderers and mercenaries for the rich and powerful. ARIA became aware of Sadira through her intelligence network, and retained the wily killer for a massive sum of money. The AI sent Sadira on many covert missions, including stealing tech from the alien Glacius’s crashed ship. One of her assignments was to fight Glacius in the Killer Instinct tournament and surreptitiously steal some of his DNA using a hidden syringe implanted in her boot. After that ARIA was able to use this genetic code sample to bypass the security protocols on Glacius’s fold core and open a portal to another dimension. Her work for ARIA had made Sadira fabulously wealthy. Realizing that she now had the capital to operate beyond the shadows, Sadira moved to strengthen her terrorist organization and become a feared name across the globe. Her activities became more audacious, forcing ARIA to warn her of her increasing presence in the public eye. When ARIA requested that she personally investigate a shrine in a remote Japanese village, Sadira assumed there was a high-powered target there for her to dispatch. But instead she found herself at the grave of a 17th century Japanese girl who had died heroically defending her village from raiding samurai. Sadira foolishly started digging up the grave, thinking that there was a treasure hidden there. This impiety awoke a powerful vengeful spirit in the form of Hisako, who pursued Sadira mercilessly no matter where she fled. Sadira was seriously wounded by Hisako, and the assassin slunk back to her lair in the jungles, clinging to life and believing that ARIA had set her up: she’d become too much of a liability and a threat to the AI. Sadira clung to her web, brooding like a wounded spider. How could she bring ARIA’s empire crashing to the ground? While Sadira pondered this, she was visited by Omen—the Herald of Gargos—who called upon her to turn against ARIA and join the path of the Astral Lord. Sadira has a choice to make that will help decide the fate of humankind…a position she relishes greatly. After reading this, I have a new found…fear of Sadira and her ways. What do you think? What does this mean for the rest of the cast of characters in KI? Jump on in to the forums and let us know what you predict will happen with the remaining characters. We’ll be back next Monday with more.